The Thumb Land Conservancy is working to preserve natural areas in the Thumb of Michigan, a postglacial landscape where northern forest blends with central hardwoods, bordered by Lake Huron, the Saginaw Bay, the Saint Clair River, and Lake Saint Clair. The mission territory of the TLC is Saint Clair, Sanilac, Huron, Tuscola, Lapeer, and Macomb Counties, but we can also work in adjacent areas as opportunities arise. 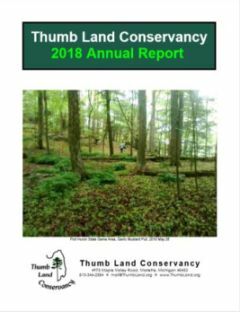 The Thumb Land Conservancy was formed in 2008 to provide an organization dedicated to filling the gap of nature preservation in Michigan's Thumb. Although much attention has been given to a few areas near Lake Saint Clair, the Thumb has been largely ignored. In recent years, we are happy to see that some new lands have been preserved, but so much remains unprotected. There is a popular misconception that little is worth saving north of Detroit because of urban development and agriculture. While much of the landscape has been drastically altered, many high quality natural areas remain. A few places are nearly pristine, resembling conditions that existed before European settlement about 200 years ago. The extensive destruction of natural areas in the Thumb makes preservation even more critical. Small, degraded fragments can be restored and expanded, and often serve as isolated havens for rare plant species. We believe all natural landscapes are important locally because they reflect a unique combination of history and features particular to that location. Many benefits of nature are obtained and enjoyed only locally. We believe it is especially important for children to have natural areas nearby where they can play, grow, and learn. We have not forgotten what it’s like to see that treasured woods in your neighborhood cut down, or wetlands carved up for more development. The TLC wants to work with you before these places are lost. If you are interested in nature preservation and you’re willing to work for it, please contact us. As an interactive addition to The Thumb Land Conservancy's online presence, TLC also maintains a web blog at http://thumbland.blogspot.com. Please visit our blog for additional news and event information.